In another major reforms push, the Indian finance minister has announced further liberalisation of Foreign Institutional Investment (FII) norms. Indian finance minister P Chidambaram on Saturday said the government is “steadily and surely” working on next generation of reforms to put the economy back on a high growth path. Addressing the National Editors Conference in New Delhi on Saturday, the minister said with liberalisation of Foreign Direct Investment (FDI) and other measures, the government has travelled considerable distance on the road to fiscal consolidation and reforms. “There were a number of sub divisions and in order to rationalize, it is proposed to merge the existing sub limits and create only two broad categories,” he said. One category of basket, he said, will consist of government securities of $25 billion and the second basket will consist of all corporate bonds of $51 billion. “Therefore from April 1, there will two baskets, one of $25 billion for government securities and (the other) of $51 billion for all corporate bonds,” he said. The Indian finance minister also said the eurozone crisis has impacted investment around the world and India was no exception. “The risk to global stability is the eurozone crisis. There is no definitive solution still in sight,” he said adding that this has led to sharp deceleration in exports. Announcing that there are more reforms on the anvil, Chidambaram said that “we are steadily and surely working on next generation of reforms”. In September last year the government liberalised FDI norms for various sectors, including retail and aviation. India currently, does not allow 100 per cent FDI in many sectors. While in multi-brand retail the cap is at 51 per cent, in telecom and banking it is 74 per cent. Chidambaram, had promised more measures to support growth in the Union Budget presented on February 28. 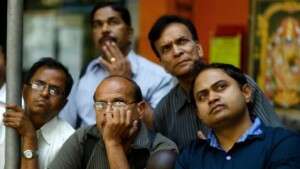 India’s economic growth reached 9.3 per cent in 2010-11. The economy grew by 6.2 per cent in 2011-12.